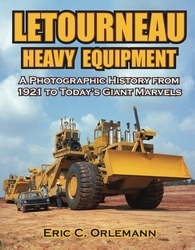 LeTOURNEAU HEAVY EQUIPMENT: A PHOTOGRAPHIC HISTORY FROM 1921 TO TODAY�S MODERN MARVELS By Eric C. Orlemann Known as the �Dean of Earthmoving,� R. G. LeTourneau is considered one of the world�s greatest inventors of earthmoving and material handling equipment. With outstanding photography, this overview spans from LeTourneau�s earliest earthmoving equipment of 1921 to today�s giant P & H Generation 2 wheel loaders produced � with LeTourneau nameplates in the cabs � by Joy Global in Longview. This companion volume to the author�s three previous books on LeTourneau includes much updated information and all new images. 176 pages, 300+ photos.